Energy exists in many forms, such as heat, light, chemical energy, and electrical energy. Energy is the ability to bring about change or to do work. 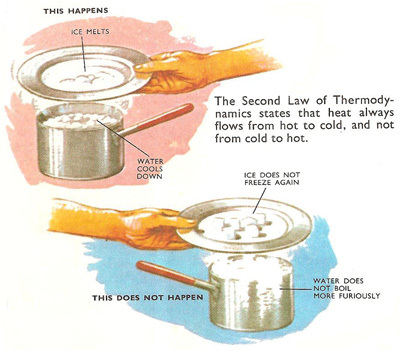 Thermodynamics is the study of energy. First Law of Thermodynamics: Energy can be changed from one form to another, but it cannot be created or destroyed. The total amount of energy and matter in the Universe remains constant, merely changing from one form to another. The First Law of Thermodynamics (Conservation) states that energy is always conserved, it cannot be created or destroyed. In essence, energy can be converted from one form into another. 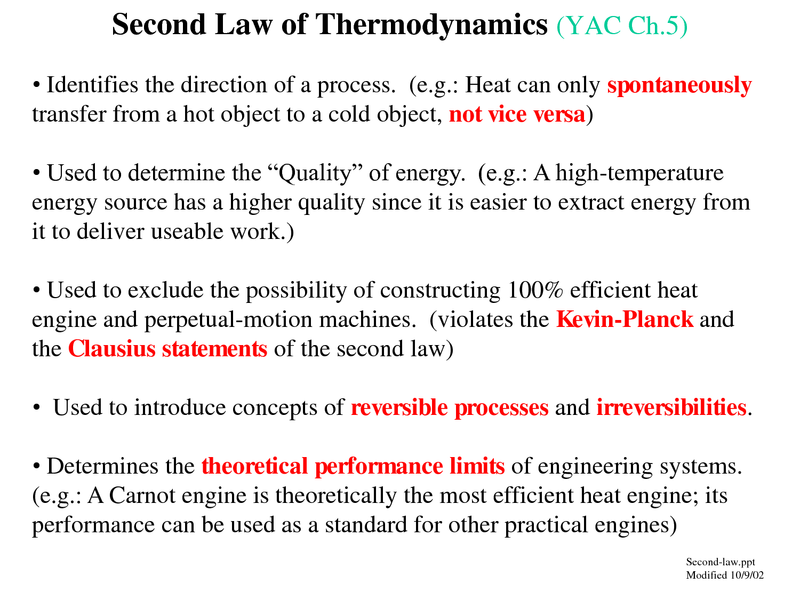 Click here for another page (developed by Dr. John Pratte, Clayton State Univ., GA) covering thermodynamics. The Second Law of Thermodynamics states that “in all energy exchanges, if no energy enters or leaves the system, the potential energy of the state will always be less than that of the initial state.” This is also commonly referred to as entropy. A watchspring-driven watch will run until the potential energy in the spring is converted, and not again until energy is reapplied to the spring to rewind it. A car that has run out of gas will not run again until you walk 10 miles to a gas station and refuel the car. Once the potential energy locked in carbohydrates is converted into kinetic energy (energy in use or motion), the organism will get no more until energy is input again. In the process of energy transfer, some energy will dissipate as heat. Entropy is a measure of disorder: cells are NOT disordered and so have low entropy. The flow of energy maintains order and life. Entropy wins when organisms cease to take in energy and die. Potential energy, as the name implies, is energy that has not yet been used, thus the term potential. Kinetic energy is energy in use (or motion). A tank of gasoline has a certain potential energy that is converted into kinetic energy by the engine. When the potential is used up, you’re outta gas! Batteries, when new or recharged, have a certain potential. When placed into a tape recorder and played at loud volume (the only settings for such things), the potential in the batteries is transformed into kinetic energy to drive the speakers. When the potential energy is all used up, the batteries are dead. In the case of rechargeable batteries, their potential is reelevated or restored. In the hydrologic cycle, the sun is the ultimate source of energy, evaporating water (in a fashion raising it’s potential above water in the ocean). When the water falls as rain (or snow) it begins to run downhill toward sea-level. As the water get closer to sea-level, it’s potential energy is decreased. 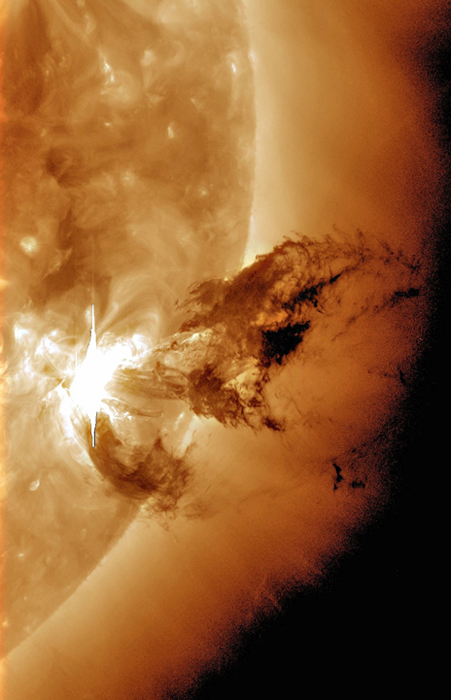 Without the sun, the water would eventually still reach sea-level, but never be evaporated to recharge the cycle. Chemicals may also be considered from a potential energy or kinetic energy standpoint. One pound of sugar has a certain potential energy. If that pound of sugar is burned the energy is released all at once. The energy released is kinetic energy (heat). So much is released that organisms would burn up if all the energy was released at once. Organisms must release the energy a little bit at a time. Energy is defined as the ability to do work. Cells convert potential energy, usually in the from of C-C covalent bonds or ATP molecules, into kinetic energy to accomplish cell division, growth, biosynthesis, and active transport, among other things. (1) The properties of a system do not change with time. 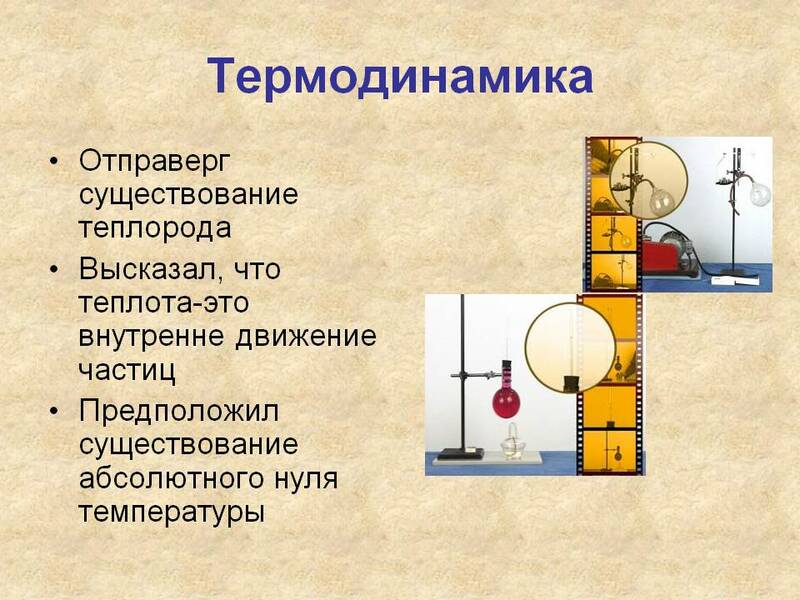 (2) The properties of a system do not depend on how it was prepared, but instead only on the current conditions of state, that is, a short list of parameters such as temperature, pressure, and density that summarize the current equilibrium. A system brought to a specific equilibrium state always behaves identically, and such states are history-independent. independence is an important factor of thermodynamic equilibrium. (3) The properties of a large number of copies of the same system at the same state conditions are identical, whether or not each copy had a distinct preparation and history. On the other hand, one might question whether or not these statements are compatible with the molecular nature of reality. Do not the molecules in a glass of water rotate and move about? Aren’t their positions, orientations, and velocities constantly changing? How then can the glass of water ever be at equilibrium given this ongoing evolution? due to random motions of molecules. However, measured over a time scale greater than the average collision time, the time-averaged density would appear uniform in space. Macroscopic properties are those that depend on the bulk features of a system of many molecules, such as the pressure or mean density. Microscopic properties are those that pertain to individual molecules, such as the position and velocity of a particular atom. Equilibrium properties of a system, measured at a macroscopic level, actually derive from the average behavior of many molecules (typically), over periods of times. The connection between macroscopic equilibrium properties and the molecular nature of reality is the theme of this webpage, and the basis of thermodynamics. In particular, we will learn exactly how to connect averages over molecular behavior to bulk properties, a task which forms the basis of statistical mechanics. Moreover, we will learn that, due to the particular ways in which molecules interact, the bulk properties that emerge when macroscopic amounts of them interact are subject to a number of simple laws, which form the principles of classical thermodynamics. Note that we have not defined thermodynamics as the study of heat and energy specifically. In fact, equilibrium is more general than this. Thermodynamics deals with heat and energy because these are mechanisms by which systems and molecules can interact with one another to come to equilibrium. Other mechanisms include the exchange of mass (e.g., diffusion) and the exchange of volume (e.g., expansion or contraction). Classical thermodynamics provides laws and a mathematical structure that govern the behavior of bulk, macroscopic systems . While its basic principles ultimately emerge from molecular interactions, classical thermodynamics makes no reference to the atomic scale and, in fact, its core was developed before the molecular nature of matter was generally accepted. That is to say, classical thermodynamics provides a set of laws and relationships exclusively among macroscopic properties, and can be developed entirely on the basis of just a few postulates without consideration of the molecular world. At this point let us think of the entropy not as some mysterious physical quantity, but simply as a mathematical function that exists for all systems and substances at equilibirum. We don’t necessarily know the analytical form of that function, but nonetheless such a function exists. That is, for any one system with specific values of, there is a unique value of the entropy. The reason that the entropy depends on these particular variables relates, in part, to the fact that and are all rigorously constant for an isolated system due to the absence of heat, volume, or mass transfer. What about non-isolated systems? In those cases, we have to consider the total entropy of the system of interest plus its surroundings, which together constitute a net isolated system. We will perform such analyses later on, but will continue to focus on isolated systems for the time being.